How much does office cleaning services cost in Singapore? How much does professional office cleaning in Singapore cost and what factors should I consider when outsourcing my cleaning? (In our previous article, we also weighed the pros and cons of outsourcing versus insourcing cleaners). This comprehensive guide helps you to figure out your office cleaning needs and the estimated cost. The first thing to establish is to be clear of the approximate number of hours needed for your office housekeeping. To make it simple for you, we have provided a daily office hourly calculator for your reference. Indicate the task required and the square feet of your space to get a gauge of the daily hourly rate needed for your workspace. How large is your office? How many toilets do you have? Now that you know roughly know how many hours is needed on daily basis, you need to find out the hourly rate that cleaning companies charge in the market. From our study of the market, offices cleaning on an hourly rate has a large range which varies anywhere from $12 to $32 per hour. As with any space, the larger your cleaning needs, the easier it is to negotiate lower prices based on economies of scale. It is also important to note professional cleaners prefer to work in fixed areas with longer hours as it involves lesser logistical movement. From experience, we know a stable and longer hour job reduces worker turnover and allows the outsourced cleaning company to plan for the periodic high touch areas like glass cleaning and high dusting. Here are the average price ranges in tiers. Again, key in the number of hours required for your office per week (including weekends), indicate the average hourly price range and enter it into the calculator below to find your estimated monthly cost. 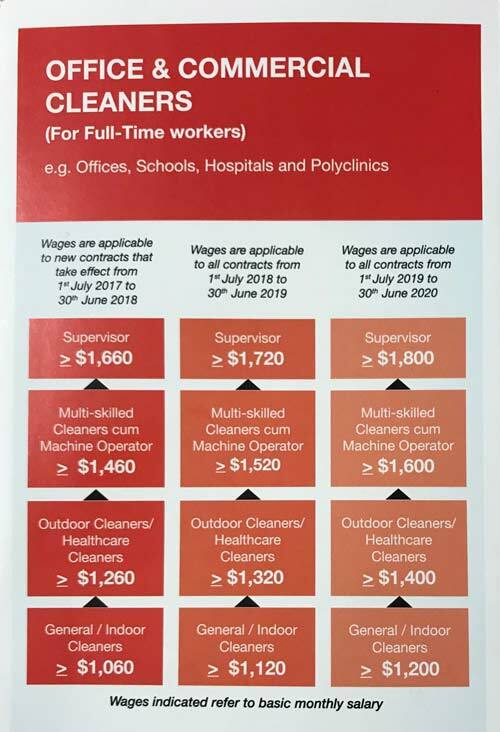 The final thing to note about cleaning prices in Singapore is that the Singapore government is taking actions to increase the wages of low-wage workers. To that end, the government is implementing the Progressive wage Model which will mandate cleaning, security and landscaping companies to increase basic wages by 3.4% to 4.6% every year for the next 6 years starting from July 2017. At some stage this cost will be shared between service buyers and service providers and it is something important to include contract price increments as you budget for hiring office janitors in Singapore. Now that we know the average market price to pay for an outsourced cleaning company in Singapore, it is important to know how to figure out if an office cleaning service is truly as professional and good as they say. After all, you are looking for substance over form. To do that, you can take this simple quiz we have prepared for office managers and facilities management teams to see if your current vendor selection processes are correct. To get a more accurate quote, book a free workspace consultation with Nimbus here.